It’s one thing for politicians, the media and the public to call for greater ethical competence in the way public administrators make decisions and conduct themselves. But, it’s an entirely different thing for public administrators to respond to those calls by confusing moral/religious beliefs and ethics/ethical principles. Consider the case of the elected county clerk of Rowan County, Ky.: Kimberly Jean Bailey Davis. Bunning held Davis in contempt and jailed her on Sept. 3, 2015. After serving five days, Bunning released Davis. Outside the jail and to the cheers of her many supporters, Davis appeared onstage locked arm-in-arm with her lawyer and a Republican presidential candidate. Davis projected the image of a heroic martyr, persecuted by the state for upholding the moral/religious belief that marriage is the union of one man and one woman. Even if a “strict” wall of separation between Church and State exists – as many commentators have maintained since Everson v. Board of Education – that wall is not germane to the Davis case. What is relevant is the strict wall demarcating moral/religious beliefs from ethics/ethical principles. For public administrators, this is a distinction with a substantive difference. Ethics and ethical principles—like those enunciated in the American Society for Public Administration (ASPA) Code of Ethics—are derived from the power of reason. They are the product of careful deliberation across generations concerning what the good requires and, as ethics and ethical principles impact public administration, what the common good requires of public administrators. Despite what Davis and others have asserted, this case was not about moral/religious beliefs but the law and politics. Having lost at the district and circuit courts and with numerous state legislatures enacting pro-homosexual marriage laws, the law and politics are not on Davis’ side. Reflecting on this case, Associate Supreme Court Justice Anthony Kennedy recently argued that government employees with religious convictions about marriage should resign. Why? They do not possess the constitutional right to act according to their sincerely held moral/religious beliefs and refuse to comply with the law. However, Bunning did not compel Davis to abandon her moral/religious beliefs. Neither was she forced to resign from her $80,000-per-year job, as Kentucky law mandates that a county clerk can be ousted only if defeated for re-election or impeached by the State’s General Assembly. Given Kentucky’s generally conservative politics, both outcomes appear highly unlikely for Davis. For her moral/religious beliefs, Davis may have suffered mental anguish. If Davis was forced to resign office for those beliefs and lost her income that might quality as suffering, depending upon circumstances. 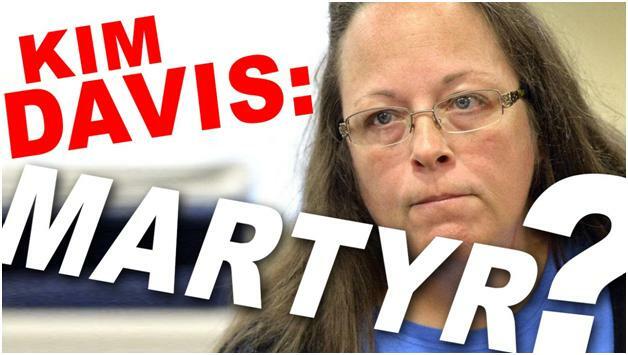 However, Judge Bunning offered Davis a reasonable accommodation for her beliefs. What about public administration ethics? Was Davis’ decision-making process and conduct ethical? As ASPA’s Code of Ethics relates to the Davis case, three principles are germane: advancing the public interest; upholding the Constitution and the law; and strengthening social equity. Incorporating those principles into one’s decision-making process and conduct demonstrates ethical competence. This failure is an important legal and political matter. Davis’ failure to comply with the ethical principles associated with public administration is a professional matter, one bespeaking the decision-making process and conduct of a public administrator who refused to serve the public. Instead, Davis used the office to judge members of the public and deal with them as she believed appropriate. While that decision-making process and conduct portray a zealous moral/religious individual, they do not represent an ethically competent public administrator. In the case of the county clerk, there was two religious discrimination issues one by the clerk and one by the federal judge. The judge should have put it upon the county board and the state legislature to solve the problem.